This species is accepted, and its native range is Macaronesia, Europe, Medit. to NE. Tropical Africa and Sri Lanka. Annual up to 90 cm. high, upright or spreading, normally much branched, green, rarely red-tinged, mealy especially on young parts but rarely densely so. Leaves variable, commonly rhombic-ovate, rarely narrower, about 1.5–9 cm. long and 0.8–5 (–7) cm. wide, without any tendency for especially prominent basal lobes, but with several coarse irregular ascending usually sharp teeth (about 5–15 teeth on each margin, rarely fewer). Inflorecences leafy, composed of divaricately branched cymes up to 5 cm. long, terminal and from upper axils. Flowers greenish, minute, about 1–1.5 mm. in diameter. Sepals 5, papillose on margins and outside, each with a blunt raised green keel towards apex only. Pericarp very difficult to detach from seed. Seeds (Fig. 2/3, p. 3) black, somewhat shining, 1.2–1.5 mm. in diameter, acutely keeled; testa under microscope marked with very close minute rounded pits. A weed of crops, old cultivations and pasture land; 1070–1950 m.
Annual up to 90 cm. high, upright or spreading, normally much branched, green, rarely red-tinged, with mealy hairs especially on young parts but rarely densely clothed. Leaves variable, commonly rhombic-ovate in outline, rarely narrower, (0.7) 1.5–9 × (0.4) 0.8–5 (7) cm., without any tendency for especially prominent basal lobes, but with several coarse irregular ascending usually sharp teeth (about 5–15 on each margin, rarely fewer). Inflorescences leafy, composed of divericately branching cymes up to 5 cm. long, terminal and from upper and sometimes median axils. Flowers greenish, minute, about 1–1.5 mm. in diam. Perianth segments 5, papillose on margins and outside, each with a blunt raised green keel towards apex only. Pericarp very difficult to detach from seed. Seeds black, somewhat shining, 1.2–1.5 mm. in diam., acutely keeled; testa (seen under microscope) marked with very close minute rounded pits. Naturalizada en Colombia; Alt. 2300 - 2900 m.; Andes. 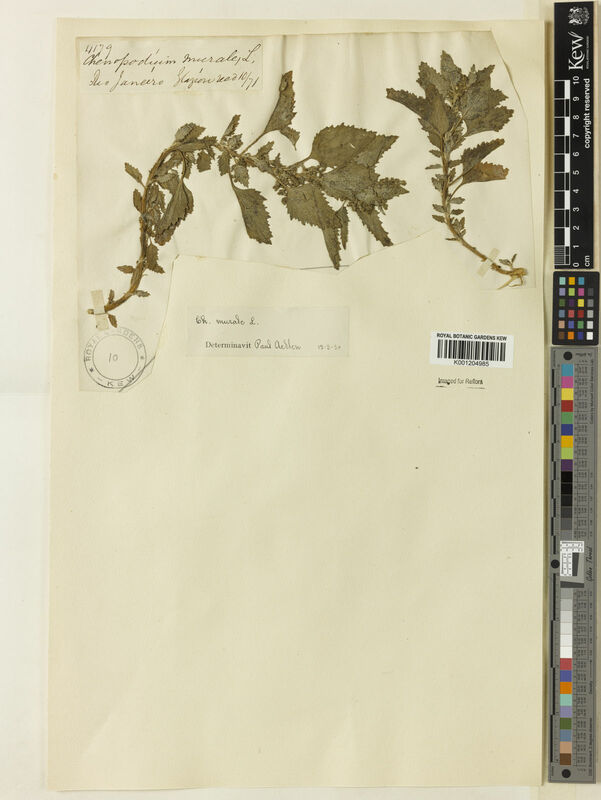 Minute greenish flowers in divaricately branched leafy cymes. 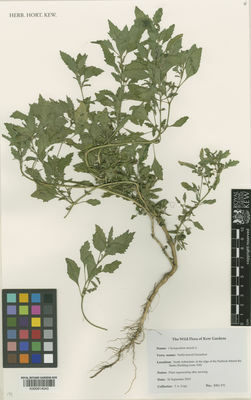 Chenopodium murale var. biforme (Nees) Moq. 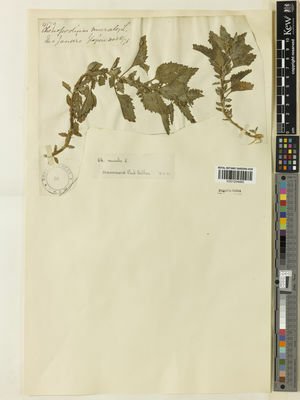 Rhagodia baccata var. congesta (Hook.f.) Hook.f. Rhagodia billardierei var. congesta (Hook.f.) Benth. Sukhorukov, A.P. & Kushunina, M. (2014). 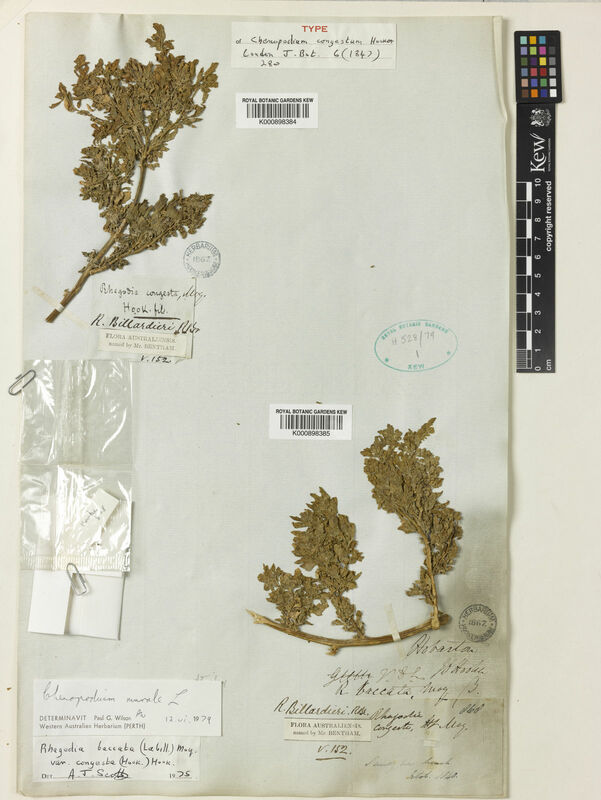 Taxonomic revision of Chenopodiaceae in Nepal Phytotaxa 191: 10-44. Bosser, J. & al. (eds.) (1994). Flore des Mascareignes 136-148: 1. IRD Éditions, MSIRI, RBG-Kew, Paris.